Icebreaker games are played at the beginning of the birthday party while guests are arriving. Ice Breakers are fun get to know you games. We've listed our favorite group Ice breaker games for you to choose from for your next birthday party. 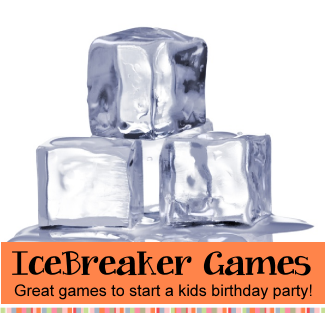 Fun and silly icebreaker games to start your birthday party and break the ice. Icebreaker party games and icebreaker activities are a great way to let groups of kids, tweens and teens to get to know each other and meet new friends. Pick one or more of these icebreakers for small groups or large groups to get your party started! For this "get to know you activity" birthday party guests are given a sheet of stickers and must get rid of them by placing them secretly on other guests. If caught they must take one of the stickers of the party guest who caught them. Only stick one sticker at a time - first one rid of their stickers wins! Fun birthday icebreaker game! Use stickers from your birthday party theme. Each birthday party guest gets a sheet of paper marked in a grid of 25 squares and in each square is a statement. Birthday guests must find people at the party that will answer yes to the statements and have them sign their name on the square. First guest done wins a prize. Sample statements: Rides a bike, Been to Disney World, Climbed a mountain, Met a celebrity, Lived in another state, Walks in their sleep... the options are endless! Fun icebreaker game! Toilet Paper Share is a funny get to know you icebreaker! Guests sit in a circle and a new roll of toilet paper is passed around. Each guest is asked to take "as many sheets of toilet paper as they think they will need" ... with no other explanation. Each guest is then asked to tell the group as many things about themselves as they have sheets of paper. For example: If one person took 4 sheets from the toilet paper roll then they would tell the group 4 things about themselves. This icebreaker is played like the toilet paper game above except with M&M’s. Or attach a certain question to each color of M&M. Tell them not to eat the M&M’s until it is their turn. For each M&M color have a category that they must say one thing about themselves. Red = Family, Blue = Personal, Green = School, etc. Play this with Skittles or other colored candies. Fun icebreaker game! Party Guests are given one half of something and must find their correct match by talking with the birthday party guests. Fun varieties of this icebreaker game are listed below. Write down jokes and their punch lines on separate pieces of paper. Have birthday party guests pick a piece of paper from a bowl as they enter the birthday party. The person with the joke has to match the person with the punch line. Read the jokes and answers out loud when everyone has been matched up. Fun birthday icebreaker game! Use Find shapes or characters from your birthday theme for the guests to match up. Use two of each item. Example: Cowboy birthday party - match up pictures or objects of horses, ropes, cowboy hats, cowboy boots etc. Cinderella birthday party - match up glass slippers, magic wands, clocks etc. If you are giving a birthday party around a holiday you can use Christmas ornaments, pumpkins for Thanksgiving, etc. Select Find well known songs known songs and write down several lines from each song. Cut the lyrics in half and place them in a bowl. Have birthday guests choose one piece of paper and tell them to match up their song lyrics with another guest. Select one song for every two guests. Switch A Roo is a fun icebreaker game where players switch seats with each other if the person in the middle calls out something that pertains to them. Set up the chairs in a large circle so that they face inwards. Choose one player to start as the Switch A Roo and have them stand in the middle of the chair circle. Switch if you have green eyes. Then all the players that the condition applies to get up from their chair and race to switch with another player that is moving. While the players are switching chairs the caller tries to sit in an empty chair. The player without a chair becomes the new caller in the middle. If the players are younger an adult can stand outside the circle and call for the player in the middle. Choose cartoon couples and write their names on pieces of paper. Have each birthday party guest choose a piece of paper from a bowl when they arrive. Ask them to find the other half of their cartoon couple. Examples: Sponge Bob and Patrick, Scooby Do and Shaggy, Bugs Bunny and Daffy Duck. Fun icebreaker game! Give Print out birthday party favors and have the birthday guests find their match. You will need two matching items for every two party guests. Fun inexpensive items are: different colored balloons, different colored noisemakers, birthday hats, crowns, plastic bugs, etc. Fun icebreaker game. Have birthday party guests sit in a circle, except for one, who is standing inside it. The person standing asks a "Have you ever" question. (ex. Have you ever been to the ocean?) If anyone else has done this they have to get up and quickly sit in another person's chair. However, they can't sit in a chair that's next to theirs. After all run to their new chairs, one will be left and they will ask the next question. Fun icebreaker game! Buy a large inflatable beach ball to be the icebreaker ball and in permanent marker write icebreaker questions all over it. Place birthday party guests in a circle and have a guest throw the icebreaker ball to another birthday party guest. The person who catches the icebreaker ball must answer the question that their right thumb is touching. After answering the question they then throw the ball to another guest in the circle. Keep the birthday party icebreaker game ball for future party games! Who is your favorite band/singer? What do you say when you talk in your sleep? Write down the name of a song or nursery rhyme on pieces of paper and fold them. For each song write it down two times. Let guests pick a piece of paper and then they must hum that song. The birthday party guests hum their song and try to find the person who is humming the same song. This is a great version of Musical Chairs and fun to use for an icebreaker. For this icebreaker game set up a circle of chairs with one less chair than the number of birthday party guests. Play music as the guests circle around the chairs. When the music stops, the birthday guests must sit in a seat. Unlike the traditional game, the person without a seat is not out. Instead, someone must make room for that person. Remove another seat and start the music again. The kids end up on one another's laps and sharing chairs! Fun icebreaker game! For this icebreaker game secretly give each birthday party guest a number and tell them not to share it with anyone. Tell them to line up and arrange themselves in numerical order without talking or holding up fingers. Kids will make up their own language and it is very funny to watch them try and communicate. You can also have them line up according to their birthday dates. Fun icebreaker birthday game! For this icebreaker game have the group of kids pair up and tell them to pick whether they want to be a 1 or a 2. Then tell them that all 1’s are chasers. They must then tag the other person in their pair and that person becomes the chaser. This is fun with a big group because they will hide behind each other. Fun icebreaker game! Players are asked questions and they have repeat their answer over and over and try to find other players that are saying the same thing. When they find another player they go together to find other players that are saying the say thing. After the time limit (30 - 45 seconds) the groups call out their answer one at a time. If someone with the same answer isn't a part of that group then the whole answer group gets 0 points. If a group has found everyone in the room with the same answer then they get 1 point. 2. What is you favorite ice cream flavor? 13. Ap on your phone? Played similar to the game of Rock, Paper, Scissors with tag thrown in for fun. On playing field – make 2 end zones at each end as a safe space for each team. In the middle of the field set up orange cones or a line of tape. Teams gather together in their designated end zones and decide on which sign they will do during that round of play. Then both teams line up at the center line across from each other. The team that wins begins to chase the losing team trying to tag them before they make it back to their safe zone. If any of the losing team members make it back to the safe zone without getting tagged then they are safe. If they are tagged then they must join the winning team. Over 200 fun and silly Would You Rather game questions. Print them out (free) and have party guests try to decide between two silly answers. For an icebreaker I usually just have everyone start in my room and start a pillow fight whoever you hit they must tell you something about them.